Aaaaaand we're back. 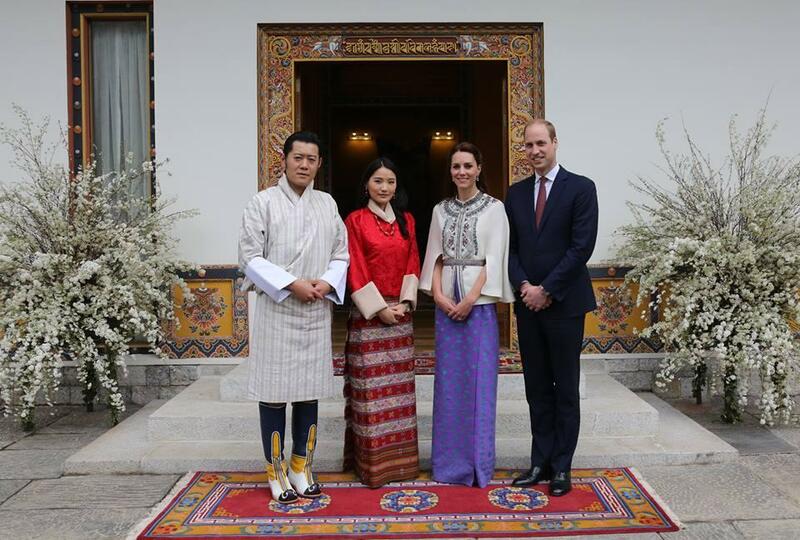 The Cambridges moved on to Bhutan on Day 5 of their India/Bhutan tour. The Duchess' first big repeat for the trip came on arrival (she also repeated a dress when boarding the plane, though that wasn't such an event). The color on this repeated Emilia Wickstead coat dress is never totally going to be my jam; it seems like it can't decide whether it wants to be beige or yellow. Color aside, it is SO MUCH improved over its original 2012 outing by the loss of the taupe hat and the gain of the belt. I'm not mad at those gold earrings, either. 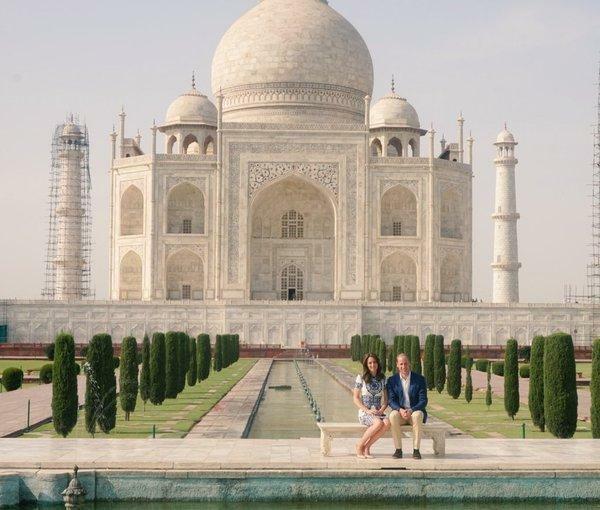 Rounding out Day 5, the couple dined privately with the King and Queen in the evening. Make that two big surprises for the day. 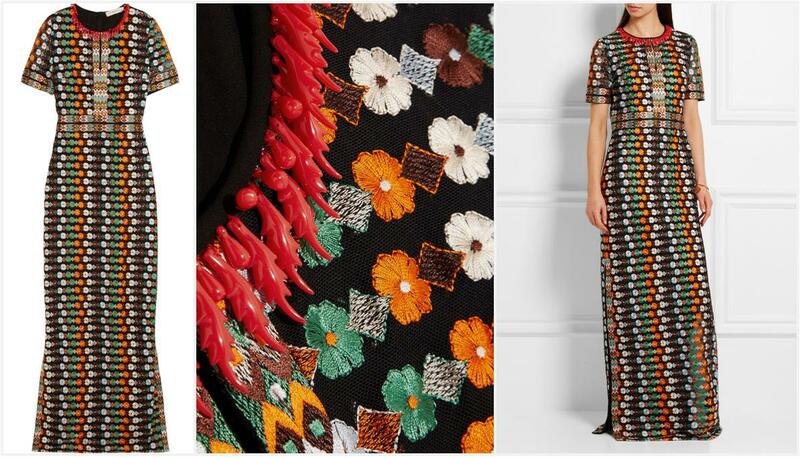 A tulle gown by Tory Burch, with embroidered florals in light blue, orange, green, and brown, and red beads at the neckline. (It's a little funny to me that a brand I associate with preppy style ends up being a go-to here, but I digress.) This is one of those outfits where I don't care for the dress itself, while simultaneously liking the way she wears it. Add another maxi dress to the tour inventory. This dress has poppies on it, and Bhutan's national flower is the blue poppy. It's also from Beulah London, and I've been waiting for something from the label to pop up on this trip. The company has a commitment to helping trafficked or vulnerable women, with India as a focus. This is the standard silhouette we see from the brand, one that is generally flattering on Kate. A solid effort for the last night in Bhutan. I'm ranking this one pretty high on the Will we ever see it again? scale, by the way. Maybe she'll go all in with the poppy theme and use it when remembrance time rolls around. Oh, look! She's playing along with my little tour game. Here's a piece unearthed from a past royal tour, Alexander McQueen white broderie anglaise separates from Singapore in 2012. I am fond of these pieces, and she gets all the bonus points for wearing the necklace given to her by Queen Jetsun Pema. Hey! William was on the trip too, I don't know if you noticed. His closet of identical blue suits got quite a workout. This is not a blue suit, though - it's a blue blazer jacket. (Variety.) 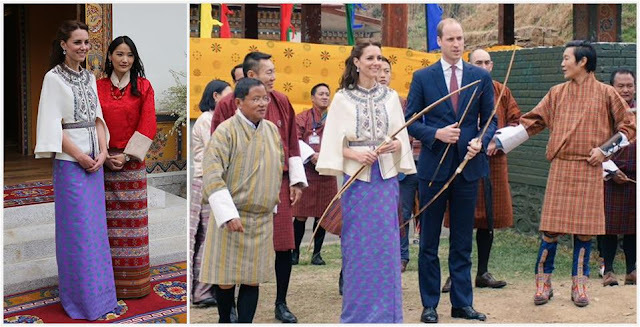 They definitely dressed towards the photo op in their coordinating blues, and Kate tried out Indian-American designer Naeem Khan for the first time. 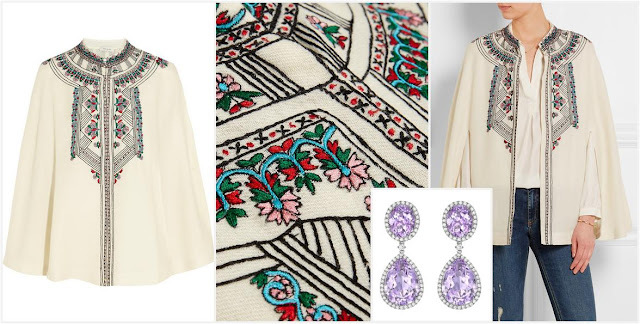 I'm a big Naeem Khan fan, and you can't get a more fresh combo than blue and white. She also wore a pair of earrings she bought during their hike in Bhutan yesterday, which sort of ties everything up in a nice neat bow. This is a late entry into the race for my favorite trip outfit. Way to end on a high note, Kate. And with that....we're done! That's a wrap on the Cambridge Trip to India and Bhutan. Phew. To say it's been an interesting tour would be a massive understatement - both on the sartorial front we inhabit, as well as overall. 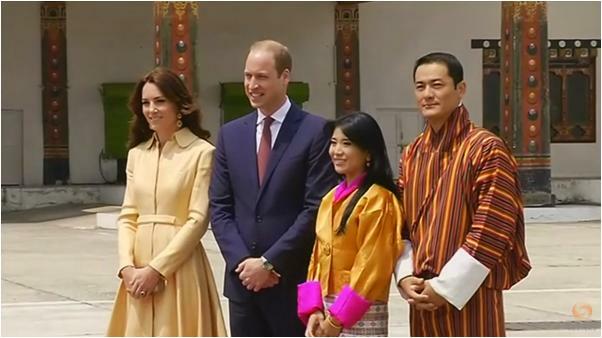 I don't think I've ever seen a tour where the notion of "diplomatic dressing" - by which I generally mean incorporating nods to the culture into a royal tour wardrobe, by way of colors, prints, designer choices, etc. - has been taken to this extent. I think there are some interesting points to be made about whether this has crossed over into costume territory, but I also think it's impossible to say whether or not this was a costumey trip until we see if any of this style will spill over into her regular working wardrobe. More than ever, I'm anxiously awaiting the results of the Will we ever see it again? game.